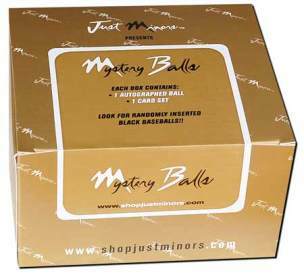 2011 Just Minors Mystery Balls is a reasonably priced way to build an autographed baseball collection. For around $50 collectors get an official MLB ball or MLB commemorative ball as well as a set of Just Minors cards. What makes the release so solid is the checklist. Rather than going with a bunch of minor stars, Just Minors has included several superstars like Derek Jeter, Felix Hernandez, Josh Hamilton and Ryan Braun. Each ten-box carton promises an autographed black ball signed in gold ink. Each box guarantees an autographed baseball. A base set of either Just Autographs or Justifiable also comes in each box. Signers include Derek Jeter, Ryan Braun, Felix Hernandez, Josh Hamilton, Buster Posey, Jason Heyward, Miguel Cabrera, Jair Jurrjens, David Price, Joe Mauer, Evan Longoria, Billy Butler, Tommy Hanson, Aramis Ramirez, Andre Ethier, Nick Markakis, Colby Rasmus, Jay Bruce and Starlin Castro. 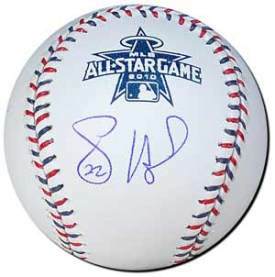 All regular autographs are on either official MLB balls or official commemorative balls from the World Series or All-Star Games. Each 10-box master carton has a limited black ball that is signed in gold. Most black balls are limited to 50 copies each.